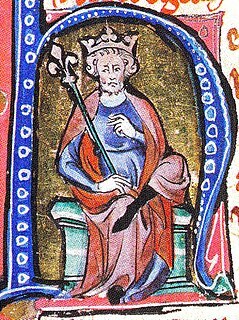 Godwin of Wessex (Old English :Godƿin; d. 15 April 1053) was one of the most powerful earls in England under the Danish king Cnut the Great and his successors. Cnut made him the first Earl of Wessex. Godwin was the father of King Harold Godwinson and Edith of Wessex, wife of King Edward the Confessor. Wulfnoth Cild was a South Saxon thegn who is regarded by historians as the probable father of Godwin, Earl of Wessex, and thus the grandfather of King Harold Godwinson. The term thegn, from Old English þegn, ðegn, "servant, attendant, retainer", "one who serves", is commonly used to describe either an aristocratic retainer of a king or nobleman in Anglo-Saxon England, or, as a class term, the majority of the aristocracy below the ranks of ealdormen and high-reeves. It is also the term for an early medieval Scandinavian class of retainers. The Kingdom of the South Saxons, today referred to as the Kingdom of Sussex, was one of the seven traditional kingdoms of the Anglo-Saxon Heptarchy. 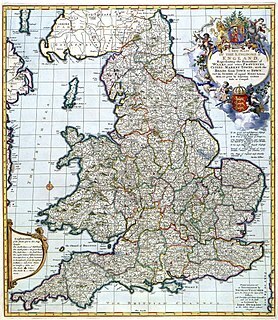 On the south coast of the island of Great Britain, it was originally a sixth century Saxon colony and later an independent kingdom. 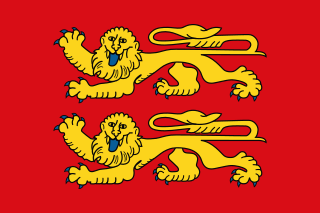 The South Saxons were ruled by the kings of Sussex until the country was annexed by Wessex, probably in 827, in the aftermath of the Battle of Ellandun. Gytha Thorkelsdóttir, also called Githa, was a Danish noblewoman. She was the mother of King Harold Godwinson and of Edith of Wessex, queen consort of King Edward the Confessor of England. 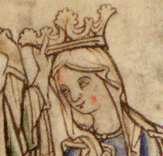 Estrid Svendsdatter of Denmark, was a Danish princess and titular Queen, a Russian princess and, possibly, Duchess of Normandy by marriage. She was the daughter of Sweyn Forkbeard and perhaps Gunhild of Wenden and sister of Cnut the Great. By Ulf Jarl, she was the mother of the later King Sweyn II Estridson and Beorn Estrithson. 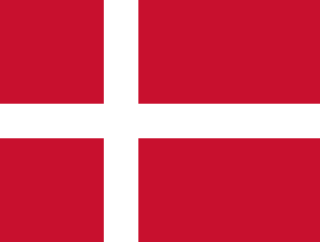 The dynasty that ruled Denmark in 1047–1412 was named after her. She was known in Denmark as Dronning Estrid, despite the fact that she was not married to a King and not a queen regnant. 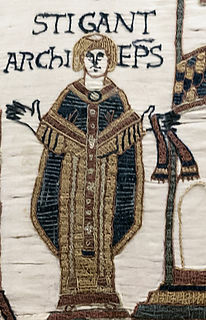 Despite his alleged responsibility for the death of Edward's brother Alfred,  Godwin secured the marriage of his daughter Edith (Eadgyth) to Edward in 1045. As Edward drew advisors, nobles and priests from his former place of refuge in a bid to develop his own power base, Godwin soon became the leader of opposition to growing Norman influence. After a violent clash between the people of Dover and the visiting Eustace II, Count of Boulogne, Edward's father-in-law, Godwin was ordered to punish the people of Dover (as he and Leofric, Earl of Mercia had done in Worcester, in Leofric's own earldom). This time, however, Godwin refused, choosing to champion his own countrymen against a (visiting) foreign ruler and his own king. Edward saw this as a test of power, and managed to enlist the support of Siward, Earl of Northumbria and Earl Leofric. Godwin and his sons were exiled from the kingdom in September 1051. Godwin, along with his wife Gytha and sons Sweyn, Tostig and Gyrth sought refuge in Flanders, while his sons Leofwine and Harold fled to Dublin, where they gained the shelter and help of Diarmait mac Máel na mBó, King of Leinster. 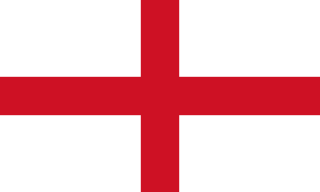 They all returned to England the following year with armed forces, gaining the support of the navy, burghers, and peasants, so compelling Edward to restore his earldom. 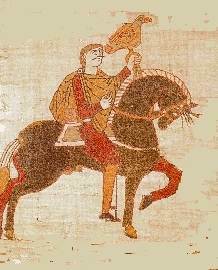 This however set a precedent to be followed by a rival earl some years later, and then by Godwin's own son, Tostig, in 1066. 1 2 Chisholm, Hugh, ed. (1911). "Godwine" . Encyclopædia Britannica (11th ed.). Cambridge University Press. 1 2 Bibbs, Hugh (1999). "The Rise of Godwine Earl of Wessex" . Retrieved 17 January 2013. ↑ "Anglo-Saxon Chronicle: Abingdon manuscript". Archived from the original on 2017-08-20. Retrieved 2017-08-18. ↑ Douglas, David C. (1990) William the Conqueror: The Norman Impact Upon England London: Methuen. ISBN 0-413-24320-6, pp. 412-413. ↑ Douglas, David C. (1990) William the Conqueror: The Norman Impact Upon England London: Methuen. ISBN 0-413-24320-6, p. 412. ↑ Lloyd, J. (14 August 2016). "The Lost Island of Lomea". The Rural Voice. Retrieved 20 September 2016. ↑ Ekwall, Eilert (1960). The Concise Oxford Dictionary of English Place-Names (4th ed.). Oxford: Oxford University Press. p. 201. ISBN 0198691033. Mason, Emma. The House of Godwine: The History of Dynasty. Hambledon Press, 2003. Stenton, F.M. Anglo-Saxon England (Oxford History of England), 2001. Walker, Ian. 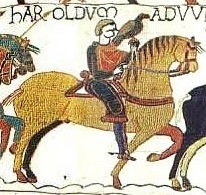 Harold: The Last Anglo-Saxon King, 1997. Tostig Godwinson was an Anglo-Saxon Earl of Northumbria and brother of King Harold Godwinson. After being exiled by his brother, Tostig supported the Norwegian king Harald Hardrada's invasion of England, and was killed at the Battle of Stamford Bridge. Lyfing of Winchester was an Anglo-Saxon prelate who served as Bishop of Worcester, Bishop of Crediton and Bishop of Cornwall. Events from the 1050s in England. Events from the 1040s in England.